Like most of my fellow Foodbuzz.com Featured Publishers & Tastemaker participants, I received a lovely sample of Buittoni's Wild Mushroom Agnolotti on my doorstep a few days ago. They seemed delicious and I was very eager to try them right then & there. But I've been rather busy lately so I wanted to save this for a nice weekend dinner when I'd have more time to play around with sauce ideas. 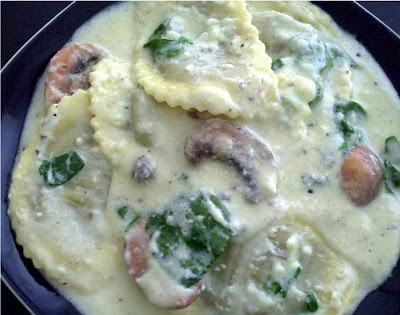 Though I generally shy away from heavier, cream-based sauces when the weather begins to warm, I thought these mushroom & cheese stuffed cousins of ravioli would go perfectly with sharp, yet creamy alfredo sauce. Something told me they'd be able to stand up to the sharpness of an alfredo sauce made with asiago instead of parmesan cheese, so I figured I'd step outside the norm and give it a go. Extra mushrooms & some fresh chopped spinach seemed to be perfect additions to this dish, tossed in at the very end. This and a glass of vino made for a wonderful meal after such a crazy busy week. Naturally, I made sure to try a couple of these agnolotti by themselves so I could get an idea of their true flavor and what future sauces I could concoct for them. Made with a variety of wild mushrooms and parmesan cheese, the filling and the tender pasta surrounding it would go quite well with a tomato-based sauce, maybe some prosciutto & peas, or some pesto (not all at the same time, of course). A couple glugs of olive oil and some freshly grated parmesan and black pepper would also be perfect for these, if you're not into a lot of sauce. This isn't the cheapest PG meal I've made; but at around $4/package (12 agnolotti per pack), this is not too expensive a meal/side if you're feeling a bit lazy, as long as you make your own sauce. Buitoni does offer some terrific sauces, but you know me... if I can make it at home, even better! If you're not particularly into sharp, pungent sauces, feel free to stick to a regular alfredo sauce (just substitute parmesan for the asiago). I found this to be a sinfully delicious sauce, but I happen to like bold flavors. Because all I had was half & half at home, I ended up with a slightly thinner sauce than most alfredos, but if you use heavy whipping cream you'll be sure to have the right consistency. Lastly, if you don't get full easily, treat this as a side as opposed to an entree. These agnolotti aren't the heartiest little pasta out there, but they certainly would jazz up an otherwise boring meal, or go great as an entree with a nice salad. Bring several cups of salted water to a boil & add the agnolotti. Cook for about 7 minutes, drain, add a couple glugs of olive oil to prevent from sticking, and set aside. In a medium saucepan, heat the cream and butter together until the butter is completely melted. Add the asiago cheese in small handfuls, whisking well to make sure the cheese melts evenly. When all the cheese has been added, heat for another 2 minutes over medium heat until completely heated through (sauce might bubble a bit; that's okay, just don't let it get to a full boil to prevent from sticking/burning). Add plenty of fresh ground pepper and stir well. Finally, add the mushrooms and remove from heat. The mushrooms will be cooked by the heat of the sauce. In a bowl or separate saucepan, combine the agnolotti and the sauce with mushrooms. Add the fresh spinach and stir gently to combine. The spinach will wilt slightly in the sauce but not be completely cooked (i.e. mushy). Sprinkle extra grated parmesan or asiago cheese, serve with a salad, and enjoy! Oh I do love the pungent sauces. This sounds wonderful! And looks grand. Hungry now. A keeper recipe for sure! This is the perfect fast dinner for company because u can throw it together lickity split after a busy day. But ur guests will swear u slaved over the stove all day. I made it using CostCo mushroom ravioli because I was there and it saved me another trip to the grocery store. And I found no fault with it all. My boyfriend pronounced it "restaurant quality!" I took that as a complement. Wink. Thank u P.G.